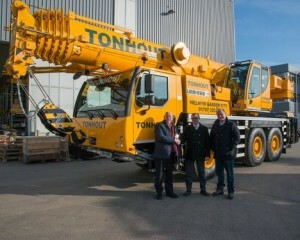 UK crane company Tonhout Crane Hire has taken delivery of its first new Liebherr crane, a three axle 60 tonne LTM1060-3.1 All Terrain. Based in Welwyn Garden City, the company has been in the crane rental business for almost 40 years and is a sister company of M and M Crane Hire of Uxbridge. The new crane features a 48 metre main boom and 9.5mto 16 metre bi-fold swingaway extension, giving a maximum hook height of 63 metres and maximum radius of 48 metres. The specification includes 6x6x6 drive, Telma retarder and remote control unit for all superstructure functions. Company owners, Maurice Tierney and sons Mark and Brian said the decision to purchase a new Liebherr was based on experience with a used Liebherr LTM1055-3.1 that it added to the fleet several years ago. They have also ordered a Liebherr 50 tonne LTC1050-3.1 city type All Terrain crane with unique single elevating cab, for delivery to M and M later this year.